This submission supports MetroLink and the well-defined transport planning which backs the choice of route, especially the interchange Whitworth Station, Tara Street, and the upgrading of the Luas Green line to Metro given the projected capacity demand along that route. But the project’s planning must be made cycling friendly for people who will use MetroLink and those who live or work or commute past stations. The use of bicycle and public transport is untapped in Dublin — building a high-capacity route like MetroLink is the perfect time to start to design for the cycling and public transport combination. This will extend the reach for MetroLink, which is especially important as most stations will not be able to support car park and ride, and a large number of other stations are unsuitable for interchange with feeder buses. IrishCycle.com is asking that the MetroLink be designed to maximise the use of bicycles and metro. This should be done via a strategy of enabling commuters, shoppers etc to be able to use bicycles at both ends of their trips by allowing bicycles on board off-peak, but mainly by providing or promoting other solutions at both ends including a mix of high-density guarded bicycle parking, covered bicycle racks, bicycle lockers, and bicycle share options (ie DublinBikes and stationless bicycle share options). 22,000 bicycle spaces are currently being built in five units around Utrecht central train station in the Netherlands, by a mix of the railway company and local authority. 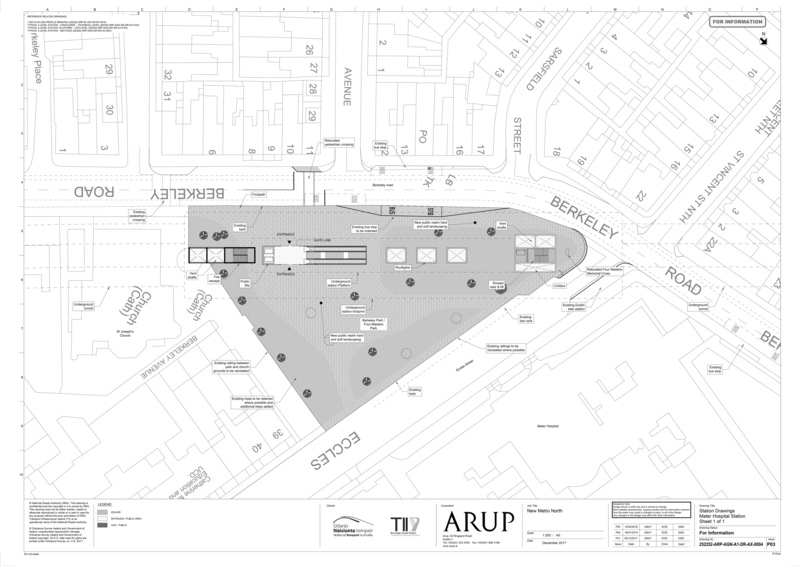 The spaces will be set around a number of facilities which are guarded. The five bicycle parking units around Utrecht central Station hold 12,500, 4,500, 3,500, 1,500, and 500 bicycles respectively. While Utrecht has a larger cycling modal share than Dublin, Utrecht has a notably lower population (1,173,179 vs 489,734 for the urban areas of Dublin vs Utrecht). So, for example, at central interchange station like Tara Street Station with Metro, Dart, Commuter and Intercity services, the designers of MetroLink should be planning for not hundreds but thousands of bicycle spaces. 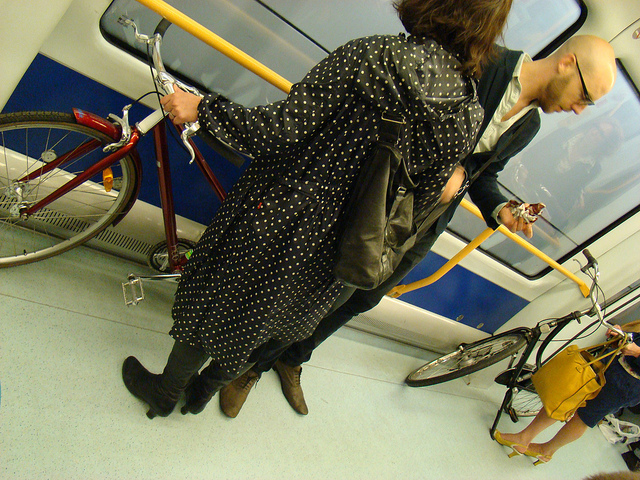 TII and the NTA must follow the National Cycle Policy Framework and design for and allow for bicycles on-board MetroLink services outside peak hours. 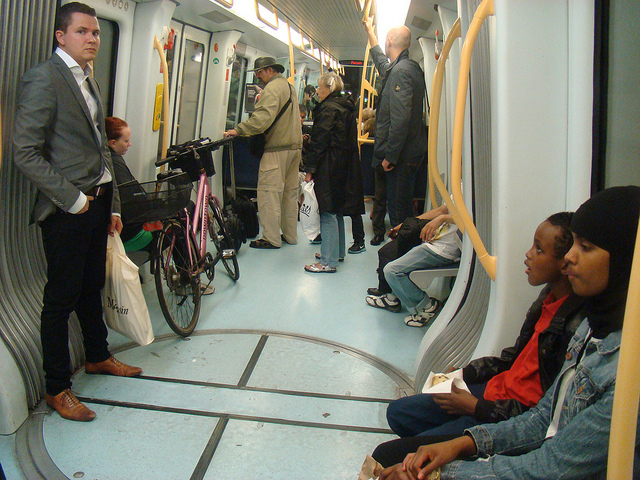 From LA to Copenhagen allowing bicycles on board metro lines of different types is the norm. 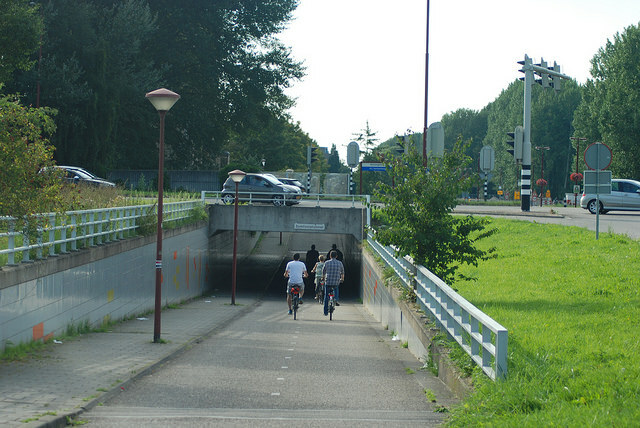 If underpasses are chosen for the design for the station access on the Swords bypass, these underpasses need for need to be fully accessible to cycling to the station and for general cycling permeability, like railway underpasses in the Netherlands (example pictured)with wide two-way cycle paths of 4 metres wide. If the level crossings on the green line are closed for the upgrade to metro, the designers must make every effort to provide for underpasses which include cycle paths of ideally 4 metres and a minimum of 3 metres if two-way, or 2.5 to 2 metres in each direction if one-way on each side of a roadway. While the designers could claim that the following issues raised are premature because the layouts are draft — similar things were said while Luas Cross City was progressing and the result was little or no provision for cycling. St Stephen’s Green East is wide with 19 metres between the footpaths alone, with an extra wide (by Dublin’s standards at least) footpath on the side of the green. The use of cycle lanes rather than segregated cycle paths beside buses is understandable and less safe. 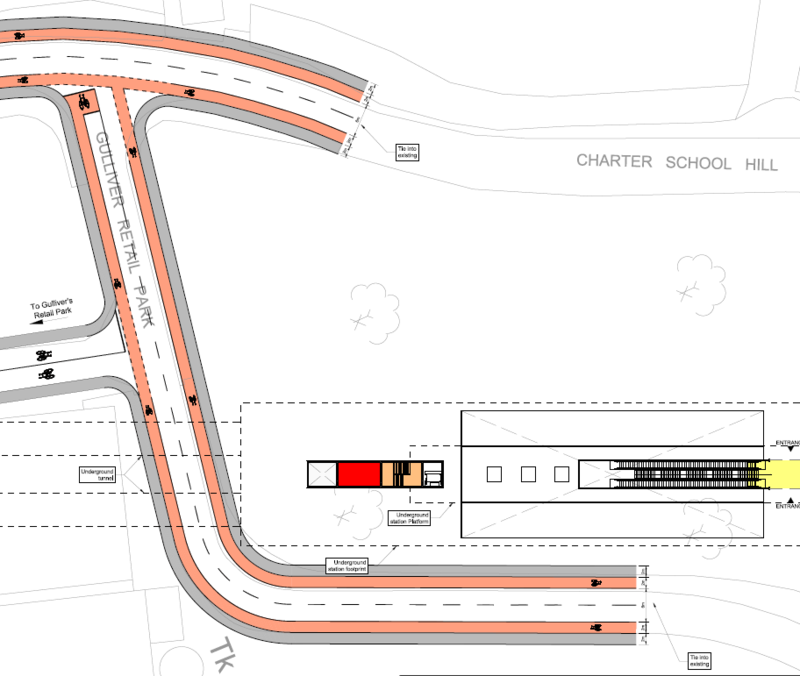 The bus stop location could be moved south to where the street widens to allow bus stop bypasses. 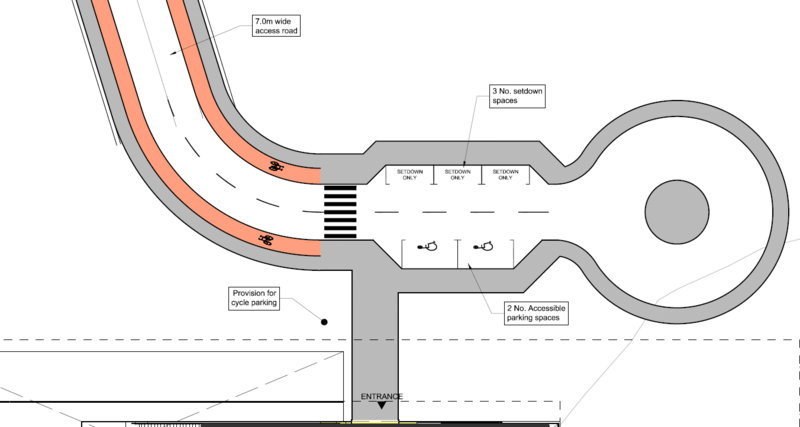 The design on the north east end of the corner of the green is also unacceptable with lack of segregation on the westbound side (top of this image) and no cycling provision at all on the eastbound side. 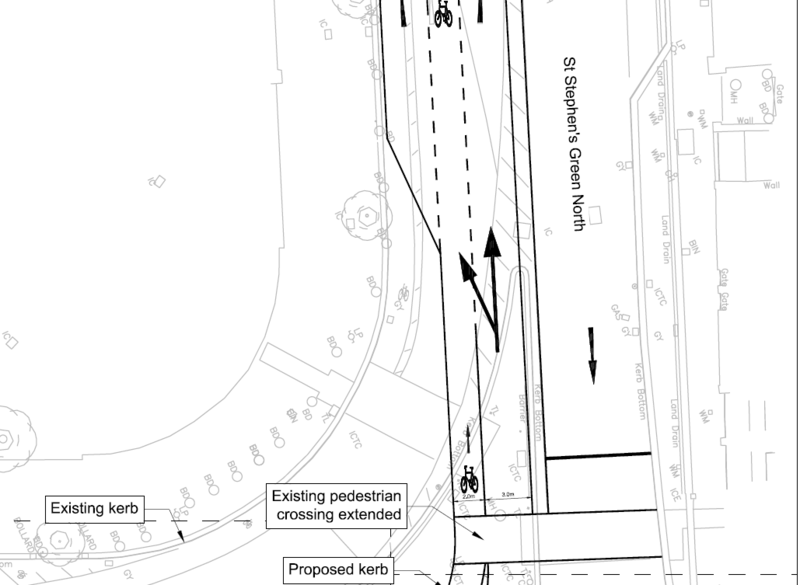 The designers of Metro should work with Dublin City Council and the OPW to look at a fully segregated two-way cycle path all the way around St Stephen’s Green. 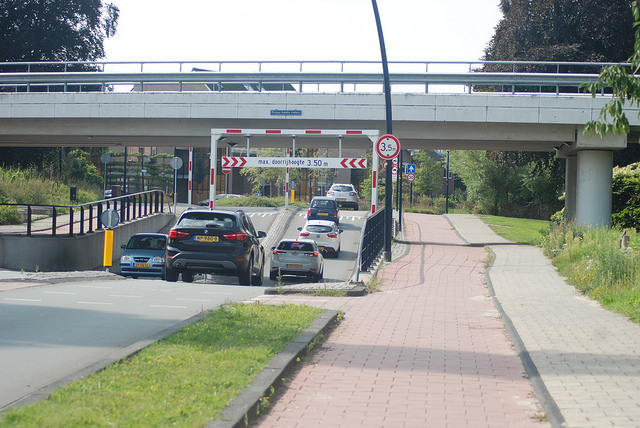 In the event that the designers or the council or a third party argues that bus stop bypass / floating bus stop are inappropriate or otherwise not suitable near a metro or busy busy stops, the above image shows the busiest cycle path in the Netherlands with a floating bus stop behind it. The new cycle lane is welcome, but this should be a segregated cycle path. 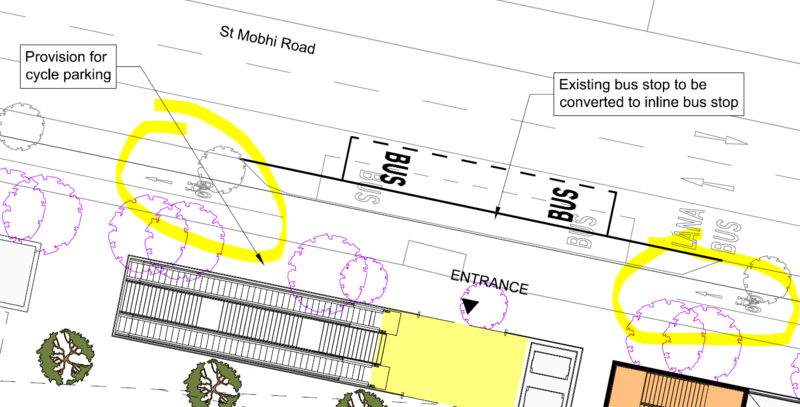 In addition, some of the ample space on the space marked as “plaza” should be used for a bus stop bypass and taxi bay bypass (ie having the bus stop and taxi bays on the outside of the cycle path, rather than having the cycle lane between buses and taxi ranks and moving motoring traffic). The O’Connell Street Station includes retaining / restoring substandard 1.5 metre cycle lanes beside what will become a more confined bus lane at the second lane will be removed for the metro stop. This is highly unacceptable. 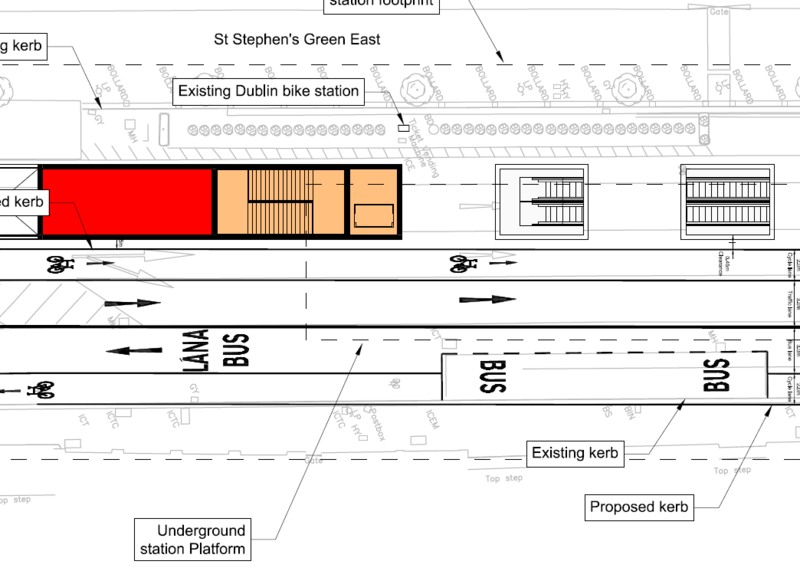 The goal should be to provide fully segregated cycle paths on O’Connell Street and the building of this station should at the least include a segregated path on the building side of the east of the street. 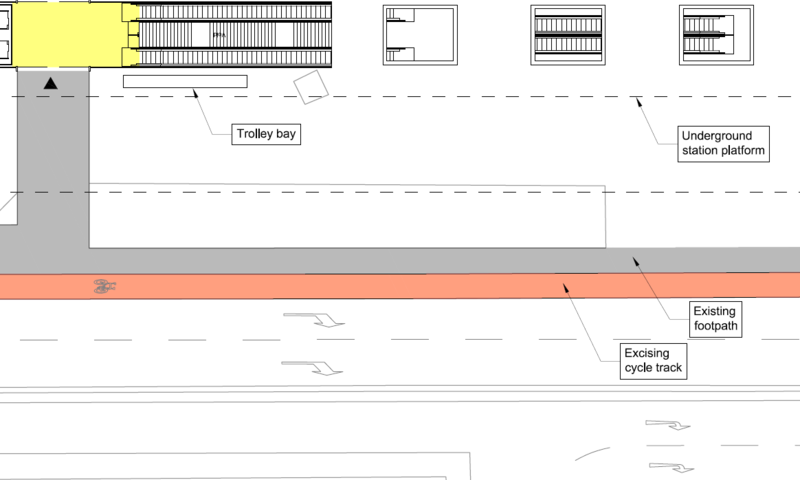 An alternative could be to look at building a north-south cycle path on the east side of the central median, even if this requires some transfer of space from the east footpath. This cycle path could run beyond O’Connell Street linking to College Green in the south and the Royal Canal Bank to the north. 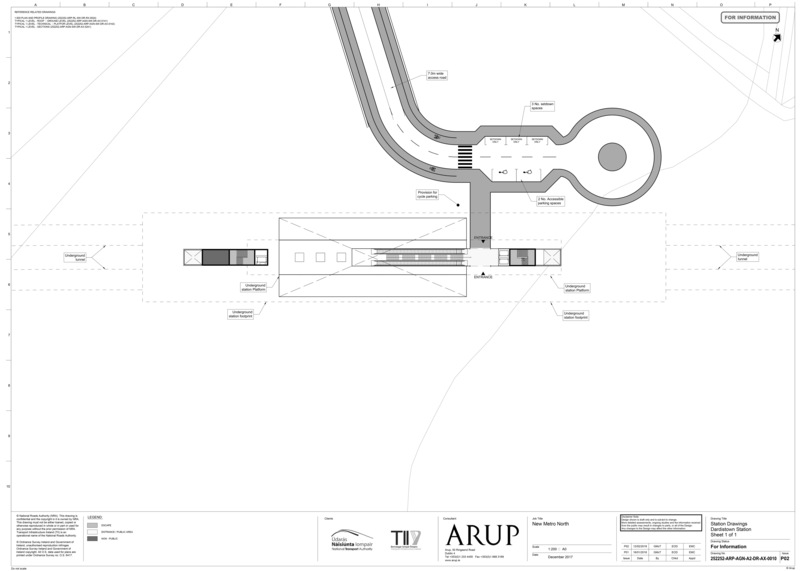 The Mater Hospital Station Station plan at ground level includes a large public realm scheme, changing the shape and nature of the small park where the station is to be built. 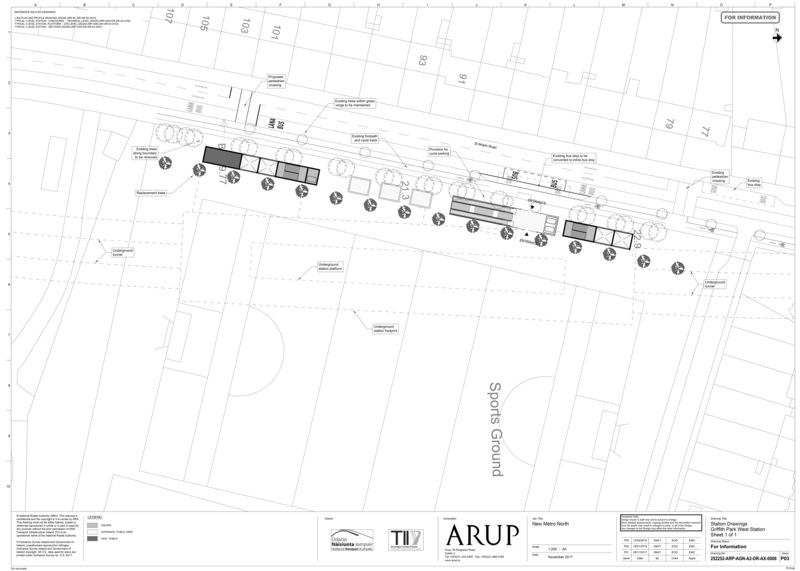 But the designers to date retain the the sub-standard, narrow and broken-linked cycle lanes. 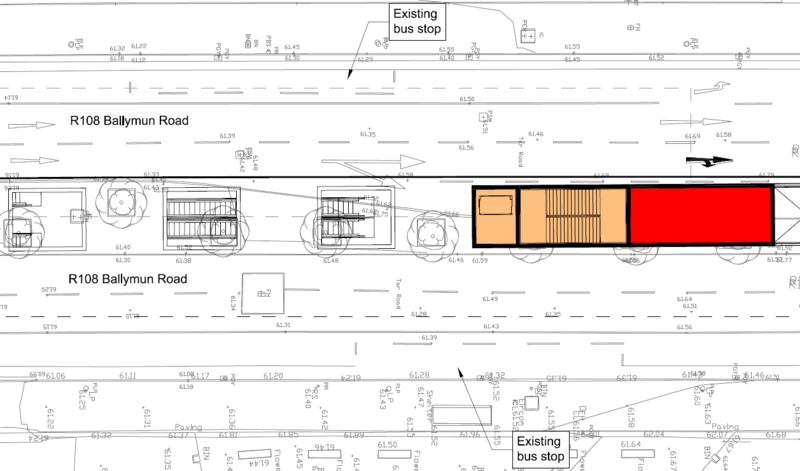 Risk with buses is increase risk by changing an indented bus stop bay when the goal should be to provide a bus stop bypass. 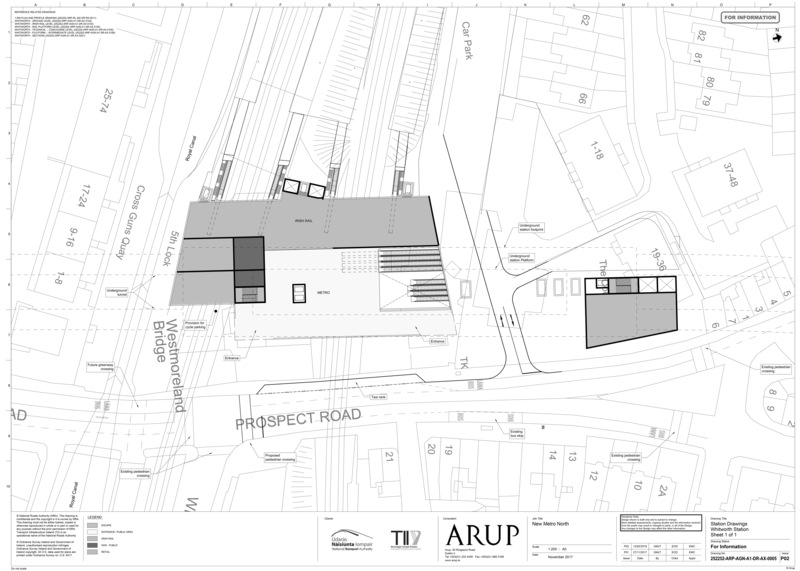 The Whitworth Station plan is world-class in terms of planned connections between heavy rail (Dart and Commuter) and MetroLink, but the current plan for the public realm outside the stations is basic and lacking vision and lacking in the need for cycling safety, especially for cycling. 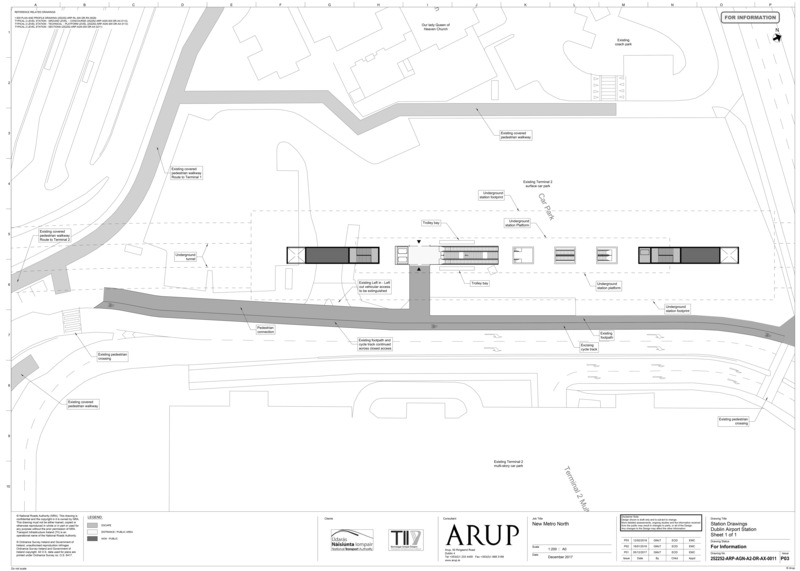 For example, a small section of the space could allow a realignment of the road to allow for segregated cycle paths on both sides of the road, or, within the confines of the area currently shown on front of the station, a two-way cycle path could link the canal greenway with Lindsay Road and open access to the back streets between Glasnevin and Drumcondra (many of which are disconnected from the canal because of the railway tracks). 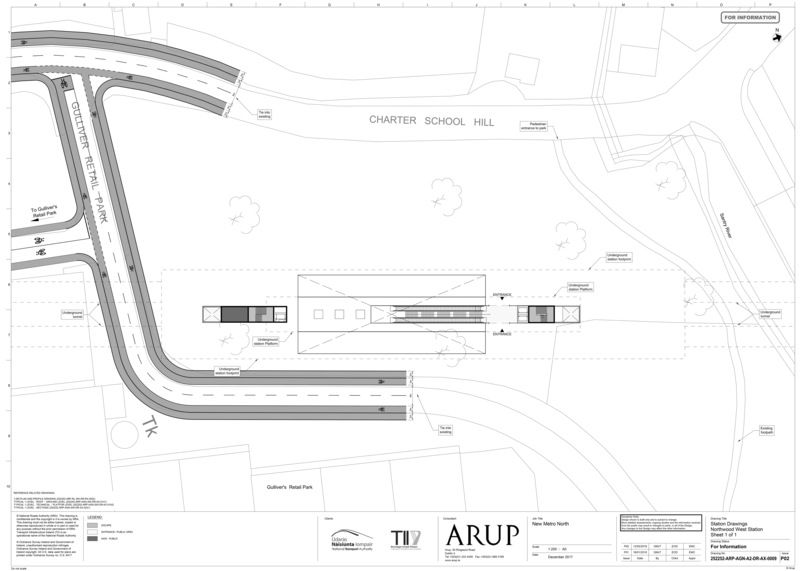 At St Mobhi Road there is an existing contra-flow cycle path which allows children and adults to cycle uphill to the schools and clubs etc without interacting with the motor traffic on the busy road. The drawing incorrectly marks this contra-flow path as a with-flow path. In the context of MetroLink, the NTA should investigate that need for bus priority on the R108 (St Mobhi Road and Botanic Road) between Griffith Avenue and Hart’s Corner. In the context of MetroLink offering residents far higher capacity and frequency, maintaining the current non-continuous sections of bus priority on this section of the R108 is highly questionable. Giving the space over to cycling would allow for safer and more attractive cycling — added to the existing space for cycling along the route, continuous cycle paths would be possable between Ballymun, Glasnevin and the Royal Canal. In any case, if the station location remains the same (given the current question marks over the station / TBM dig site), MetroLink should also include a two-directional link to the future River Tolka Greenway. The proposed Dublin City University station is located further from the university than the previous Metro North proposal — making the station a 15 minute walk for able body students. Cycling reduces this to a four minute trip, stationless bicycle share — which universities have showed a strong interest in promoting — enables this kind of trip to be made without students and staff needing their own bicycles. To enable cycling into DCU and to residential areas via St Pappin Road, a two-way cycle path should be installed from the Metro station to the Ballymun Road entrance to DCU and the university should progress a previous plan to make that entrance only for people cycling and walking. Cycling from this station will get users to Santry Shopping Centre, the centre of Finglas, Whitehall and Beaumount in 10 minutes or less, but the conditions for cycling in the area are less than attractive and poor at major junctions. 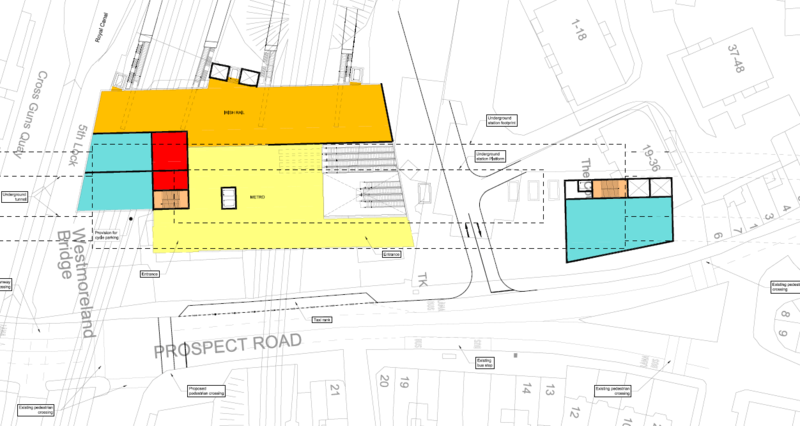 While the drawing is not clear, the current proposal for after building of the MetroLink station in the middle of the road, is to reinstate the Ballymun Road as a six lane dual carriageway with narrow, sub-standard cycle lanes inside the bus lane and no bus stop bypass. The concept of Metro users stepping out of lifts or escalators and be right beside one of three of the dual carriageway lanes on each side seems highly questionable from a road safety and user comfort point-of-view. The cycling facilitates at the Northwood are not defined as cycle lanes or cycle paths but appear to be cycle lanes given the design at junctions. This approach and a lack of a verge is highly inappropriate to the context of these roads serving as HGV truck access to the rear loading bays of Gulliver’s Retail Park, a Tesco Distribution Depot and other freight transport businesses. The approach in this area with little to no space constraints should be fully-segregated cycle paths and at the very least the planning application / railway order for MetroLink should include (a) a link to the other side of the Ballymun Road for access to north Ballymun, Finglas, and local trip generators such as Ikea, and (b) an upgrade of the east-west route in Northwood to serve not just Northwood but also Santry and the business parks on the Swords Road. 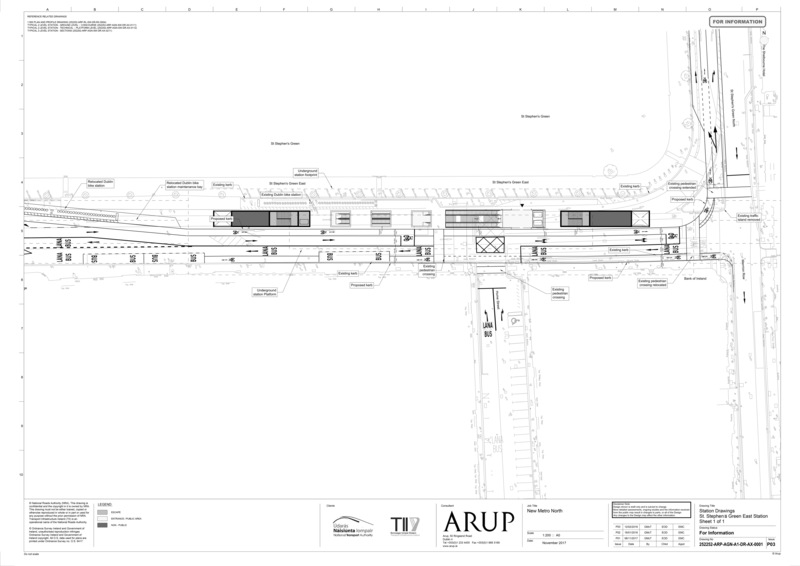 The drawing above of the Dardistown Station entrance shows no measurements for cycling or walking facilitates, these however appear to be narrow compared to the parking spaces and there is no reason why a verge / buffer is not provided between the cycle path and the roadway. Nor does it show if the cycling facilitates are segregated or not, and nor does it show how the cycling facilitates link up to the junction of the nearest road etc. There is mention cycle parking, but also no details of this. 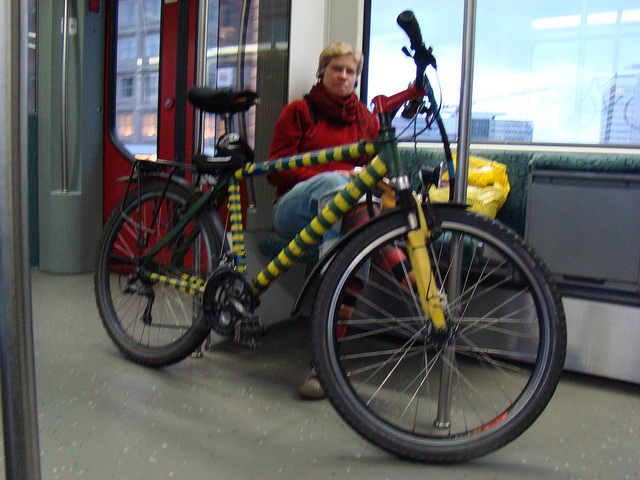 While an airport Metro stop does not bring cycling to mind as most passengers will be users of the airport, the large airport campus, and nearby facilitates house thousands of employees. 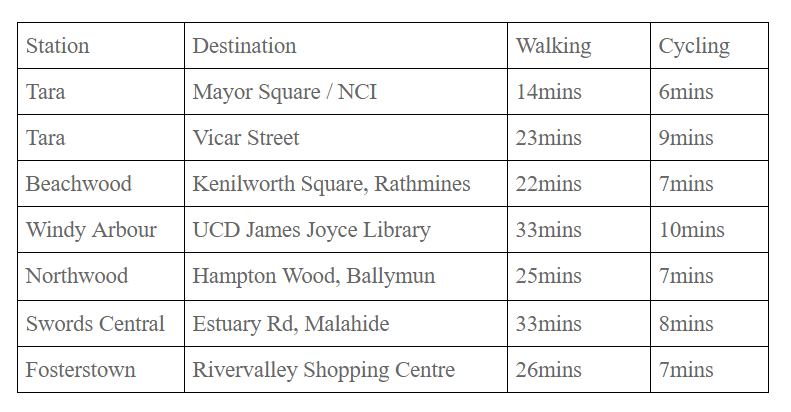 Many of these are outside ideal conditions, including staff at the Airport Business Park and the ALSAA Sports Centre both on the other side of the Swords Road. Dublin Airport, supported by the NTA, should follow the lead of Amsterdam Schiphol Airport to promote cycling as a means of staff travel around the airport campus. 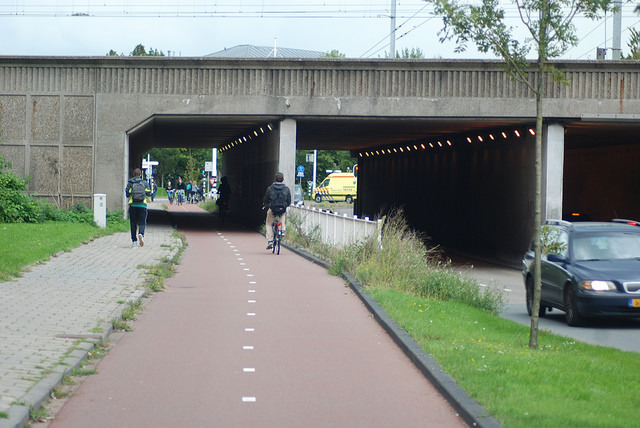 The drawing above shows no change to the low-standard airport cycle paths — the cycle path should be upgraded to a two-way cycle path segregated from both the road and footpath by a grass or other verge / buffer. The cycle paths around the airport should also be reviewed. 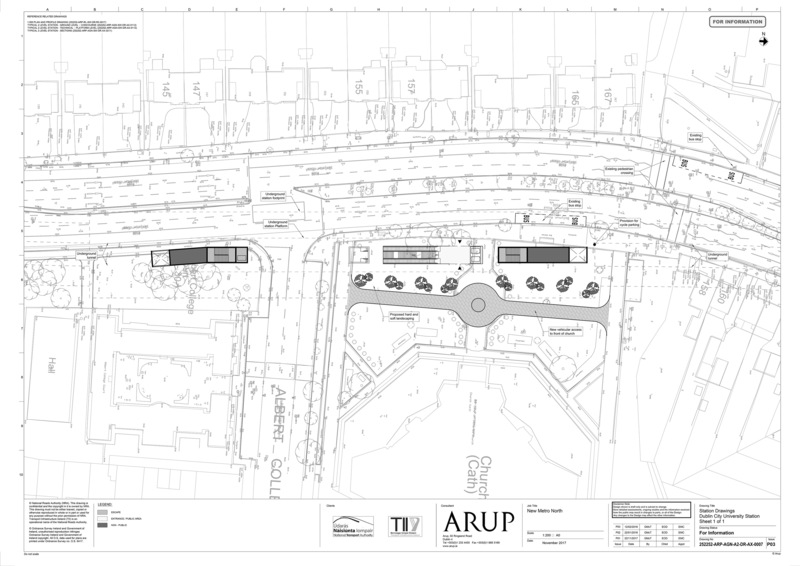 For example, shared crossing points / junction areas with pedestrians which are poor for both pedestrians and cyclists could be redesigned; minor junctions could be fixed to give priority to cycling and walking, and two-way and one-way paths which currently abruptly end should be extended (for example, between Topaz / McDonald’s and the Swords Road). I hope the planners and designers, and most importantly of all, the politicians, listen to you Cian. Keep up the excellent work. Great work on this submission. Great submission, and than you for your continued advocacy in this area. Could you provide a link to the detailed proposal with all the redesigned road layouts? The only document I can find online just contains information about the route and station locations without any information about station or road design. Also, where is the Plaza on Townsend Street going to come from? Are they planning to demolish the building beside the Irish Times building or something? I’d like to read the detailed plans because this is really confusing me. @Arran: Yes, they are planning to demolish the building beside the Irish Times building. 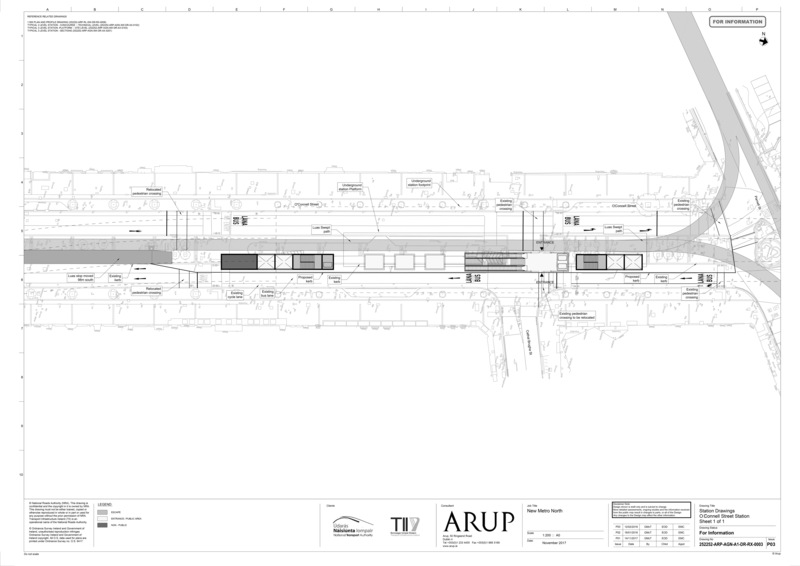 The drawings above are in the Concept Engineering Drawings file, here: http://data.tii.ie/metrolink/alignment-options-study/study-1/metrolink-concept-engineering-drawings-book.pdf — note: this is a 107Mb PDF. It will not load or will load very slowly on many devices. The links to the drawings and reports are strangely only located in a drop-down menu — if you to https://www.metrolink.ie/ and click on “menu” it brings up links to pages and around 20 PDFs of drawings and reports — note: some are very large, up to 170Mb. Cian…..great and comprehensive submission. Important to reference necessity of getting details right! Fantastic submission. Keep up the good work.